The system wasn't working when a tsunami struck Sunday, killing hundreds. Tsunamis have devastated the shorelines of Indonesia and other Southeast Asian countries before, but the subsequent deaths and injuries still didn't result in comprehensive warning systems. When a tsunami hit Indonesia early Sunday -- killing more than 390 people and leaving hundreds of others injured or missing -- the country's residents were blindsided by the waves. Because of a lack of funds, vandalism to the buoys that were a part of the warning system, and technical faults, there hasn't been an operational tsunami warning system in Indonesia since 2012, according to Sutopo Purwo Nugroho, a spokesperson for Indonesia's National Disaster Management Agency. The Tsunami Early Warning Signals that Indonesia had put in place is designed to monitor earthquakes, but not undersea landslides and volcanic eruptions. That may surprise many, however, since Indonesia is home to 13 percent of the world's volcanoes. (Ardiansyah/Antara Foto via Reuters) People who lived on the coast of Bandar Lampung rest at a government building after they evacuated following a tsunami in Indonesia, Dec. 24, 2018. Sutupo said there was no tsunami advance warning system on the night of the latest disaster. Joko Widodo, Indonesia's president, announced Monday that the repairs need to be fixed, eyeing upcoming budget funds as a way to do so. "I have ordered a check of all the [tsunami detection] equipment and the replacement of broken ones. I think in the new budget year of 2019, early January, I will order the replacement of broken equipment or old ones, which can no longer be used," Widodo said, according to the presidential press media and information bureau. This weekend's tsunami was the second deadly one to hit the island nation in 2018. The earlier one, which struck in late September, killed more than 2,500 people, the Associated Press reports. 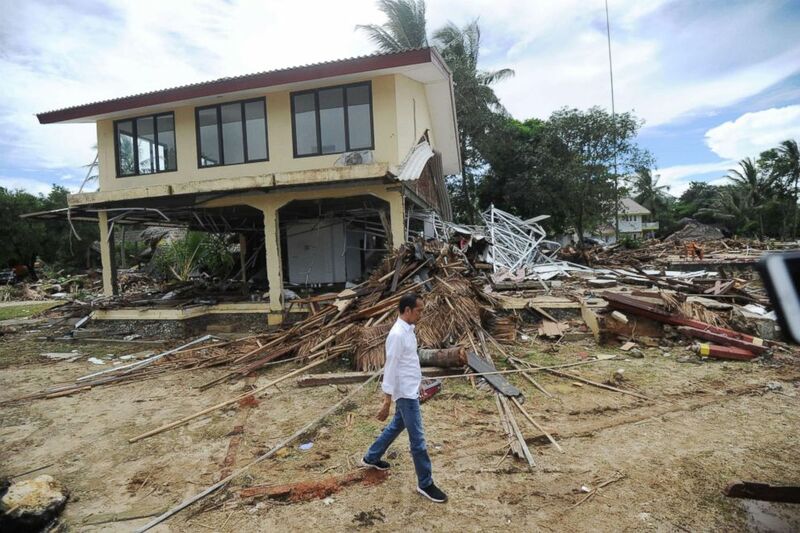 (Sonny Tumbelaka/AFP/Getty Images) Indonesia's President Joko Widodo walks past debris at the Mutiara Carita Cottages in Carita in Banten province on Dec. 24, 2018, two days after a tsunami. One of the major differences between the two tsunamis was that in September, there was an earthquake that warned locals that the large waves would likely be coming; the more recent tsunami wasn't preceded by an earthquake, so it didn't trigger a warning. According to a United Nations report from a regional working group focused on tsunami warning systems, which was held in Vietnam in March, the Indonesia Tsunami Early Warning System (InaTEWS) focuses on earthquake information and included 170 seismic broadband systems, 238 accelerometer stations and 137 tidal gauges. Since there was no earthquake this weekend -- and instead a volcanic eruption and underwater landslides -- this system would not have applied.